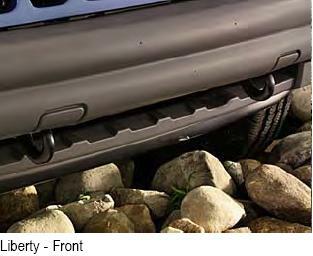 Tow Hooks for the Jeep Liberty are rated with a towing capacity up to 5,500 pounds or 1.5 times the vehicles GVWR (depending on vehicle). These tow hooks securely mount to the frame and are fully tested for durability and load capacity. Black, front, 5,000-lb capacity, set of 2. Black, rear, single hook, for use without Hitch Receiver only, 5,000-lb capacity. I had these for the 2012 Liberty that I had. These Tow hooks Fit well and were not hard to install took 30 min. Prosreally cant live without them if you plan on 4wheeling as there is nothing to hook up to if need be. easy to install and did not remove a thing as the instructions said. ConsThe only thing you really have to cut the squares above the hooks in order to use them properlly but was not a big deal to do.